Summary from Goodreads: "Manhattan, Thanksgiving Eve, 1945. The war was over, and Eric Smythe's party was in full swing. All his clever Greenwich Village friends were there. So too was his sister Sara -- an independent, canny young woman, starting to make her way in the big city. And then in walked a gatecrasher, Jack Malone -- a U. S. Army journalist just back from a defeated Germany, and a man whose world-view did not tally with that of Eric and his friends. 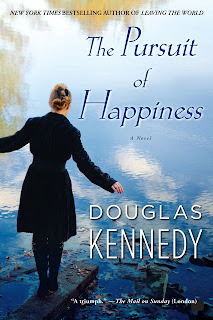 Set amidst the dynamic optimism of postwar New York and the subsequent nightmare of the McCarthy witch-hunts, The Pursuit of Happiness is a great tragic love story; a tale of divided loyalties, decisive moral choices, and the random workings of destiny." I know I usually review non-fiction books but every once in a while I come across a fiction book that is so wonderful, I feel compelled to review it. This is certainly one of those. The book begins as a mystery- Kate is at her mothers funeral when she sees Sara, a woman she has never seen before. The two quickly establish contact and the story then flashes back to tell the story of Sara. Sara is a witty, bright and highly independent woman. She's a talented writer and is devoted to her older brother Eric. During one fateful party on Thanksgiving Eve 1945, falls in love with Jack Malone. Jack Malone is conservative, Irish, and alas for poor Sara, only in town for the night. The two spend a passionate evening together and vow to stay in contact. I'm not going to spoil the plot of the book by revealing what happens next, but suffice it to say that this meeting between Sara and Jack has huge ramifications for her and those around her; it shapes the course of her entire life. The characters in this book are excellently crafted. Sara is highly credible and likeable, she easily evokes sympathy from the reader. A credit to Kennedy's writing, early on in the book you begin to care about her and this remains true throughout the book. The relationship she has with her brother Eric is also very realistic- there is real tenderness and warmth between them. Eric is a funny and smart while Jack is incredibly human. All of the characters are complex, there are no good guy/bad guy distinctions. Every character in the book is vividly described. I felt that I really knew these people. One of my favourite things about the book was its setting. Sara grew up in the McCarthy era, the time of the "red scare". Communists and other left-wing people were treated very harshly by the government. This is rather unfortunate for Sara's brother Eric, who was formerly a member of the Communist party. Throughout the book suspicion, deceit were rife; friends betrayed friends in order not to be branded as anything even vaguely left. I also found the effort they all made to define themselves as American and to conform to expectations of what what it was to be American facinating. Overall, this is an incredible book. It's well-written, compelling and well worth a read. I think the cover of the book reveals a lot- Sara is walking a plank, trying to remain steady and reach the end. Each of the characters pursue happiness but though all have glimpses of it, none of them ever really achieve it. Overall, a well deserved four and a half stars. Thanks for the review, and for letting us know about this one. I'm always intrigued by this time in history, and particularly the paranoia that so characterises it, and this sounds like one to keep an eye out for. This one sounds really good. I think I need to add it to my list. This is my fourth Douglas Kennedy novel and as usual it did not disappoint. The characters are vivid - especially Sara Smythe and her brother. This author creates strong female characters who are far short of perfect but whom the reader can identify with and cheer for.